A FLV file (also known as Flash Video) is used to be a very common video formats, but not now. If you have downloaded and saved many FLV files on the computer such as video lectures, live music videos, etc. and only want the audio part of the files for playing on the mobile devices, what you need is a useful FLV to MP3 converter to convert FLV videos to MP3 or other audio file. Here we're going to introduce a professional video converter – Joyoshare Video Converter to help you out. Read on to learn how to convert FLV to MP3 easily and efficiently. 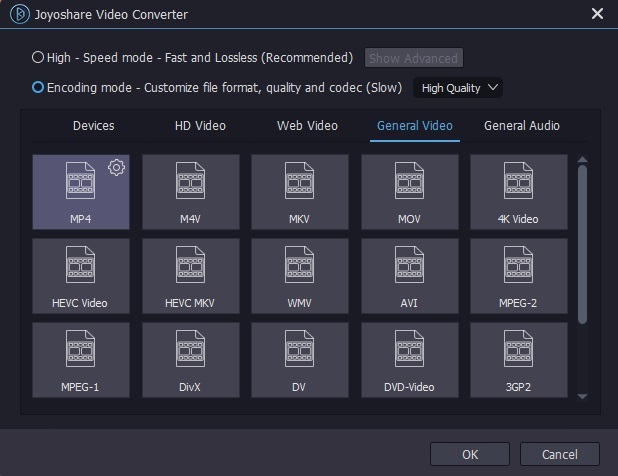 Among the numerous video converting tools in the digital market, Joyoshare Video Converter stands out because of its super fast conversion speed and powerful capability of preserving almost 100% the original quality of files. Besides converting FLV to MP3, this ultimate video tool supports to convert between almost all popular video formats including MP4, MP3, AVI, MOV, MPG, 3GP, M4V, OGG, MPEG, 3GP, 3G2, WMV, ASF, RM, RMVB, DAT, MKV, DV, NUT, H.264, NSV, VOB, DVR-MS, MXF, VRO, WTV, OGV, and many others. Additionally, Joyoshare FLV Converter allows you to export converted files onto various portable devices such as iPhones, iPads, iPod touch, Galaxy series, Windows Phones, Xbox, PSP, smart TVs, etc. The intuitive interface and clear buttons makes it easily to convert FLV to MP3 or among different media formats. After getting a brief understanding about Joyoshare Video Converter, next let's move to the step-by-step guide to show you how to convert FLV videos to MP3 with Joyoshare FLV to MP3 Converter software. First of all, please free download this program and install it on your PC or Mac. Double click Joyoshare Video Converter icon on your desktop to run it. Then click the "Add Files" button to import one or several FLV videos to the program. You can also simply drag and drop the folder that contains the FLV files you want to convert. Next press on the "Format" button and go to select "General Audio" > "MP3" and set it as the output format. You're also freely to change the parameters for output MP3 audio files like channel, codec, bit rate, etc. according to your needs. After all the settings are get ready, now you can click the "Convert" button and ask Joyoshare begin converting FLV videos to MP3 audios. A few seconds later, you can find your new media file on the destination folder.